Since the release of collosals, Haley2 with a stormwall or two has become a very difficult matchup for Khador, considered by most to be the worst matchup for the faction. High defense is never a particularly effective protection against deadeye gunmages. Khador jacks are inefficient and can be a liability against stormsmiths and other disruption effects and Haley’s control spells. In the olden days, and I rise a tankard to those times, you simply ground through the feat knowing that both Haley and a Cygnar army loses its steam after time rights itself. Stormclads aren’t difficult to kill, and you only needed your remaining models to push into zones and win by scenario or begin to turn attrition around on her. Now though, there is a giant metal bulwark at the center of her forces the majority of the time. It’s very difficult for infantry to get to grips with, and it’s difficult to have enough heavy lifting after her feat to kill it. And be sure that her army will focus on everything that can kill it. When I played Haley2, my goal was to kill a heavy at range, charge and kill another then feat and hopefully kill another the next turn. That’s the ideal, but even if I only get two before the ‘wall becomes vincible again, that’s usually more than enough. So what is a Khadoran to do? It’s not like you can dodge the most popular caster in a very popular faction. She’s everywhere. I’ve been thinking about it a lot, as I am wont to do. And I am growing certain that there are 3 lists which have the best chance against Haley2 with a stormwall or two in Khador. Ponies, I ALWAYS suggest Ponies. The first of these is Vlad3’s theme force. The idea being, especially against 2 stormwalls, that by running forward really far and fast first turn, you force an early feat while they shoot and hang back. This can gain you a huge amount of scenario tempo, and you have space to back off on the feat. I’m not a huge fan. If only because running cavalry against big cannons is just not something I can find reliable. That may well be a personal thing, I’m not good at gambling a game on how one grand play works out. People have definitely had success with it though, and it’s worth investigating, I won’t be talking about it much however. I will say that Vlad3 is an absolute ball to play with. He’s very, very fun. Some people have discussed him in the Haley2 matchup compared to Butcher3 in this thread. Kriegsspiele has written on Vlad3 a lot, including this thread. If this is your choice, Be Aggressive. Dragons? We don’t need no stinkin’ Dragons! B. Traven who? Back on topic, shockingly, when planning to take destructive output to the maximum, the Butcher of Khardov is the man to look into. Both Prime Butcher and Butcher Unleashed are my best bets. And both of them are going to use scenario to force Haley’s hand. For Prime Butcher I think the best list you can field against Cygnar, and indeed many gunlines, is the Claws of the Dragon theme force. This lets you take 3 units of Black Dragon Iron Fang Pikemen, often paired with 2 clam jacks and Butcher himself. Most of the army advance moves, so you get up and across the board at a shocking speed. Cygnar can find it very difficult to get a foothold in many scenarios with that much Armor, that far up the board. It is vital to try and envelop the ‘walls, and get few Iron Fang around the covering fire. 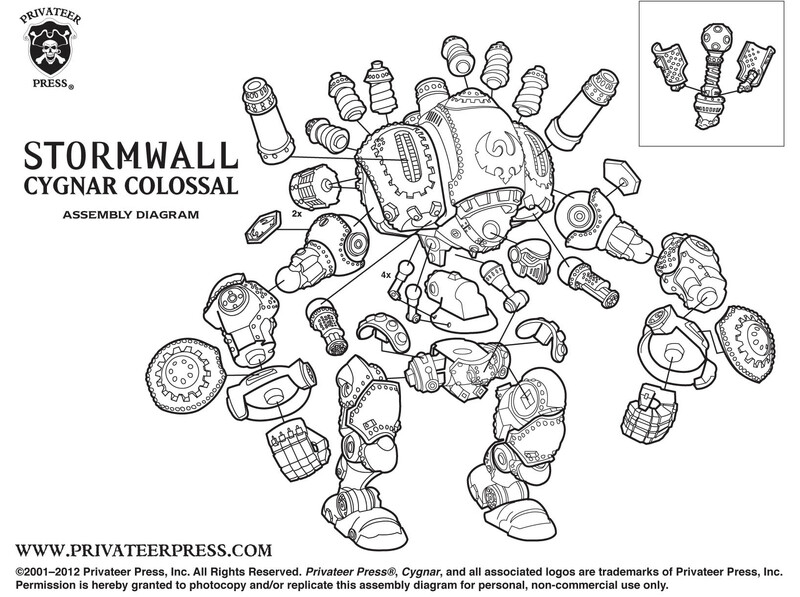 Dinging damage on the stormwall here and there, means that you will eventually drop at least one on your feat turn. You have to push forward hard and fast and never let up. Keep Butcher safe and dominating zones with your army pushing past the zones. Always kill objectives when you can, many players will be too busy using covering fire to protect the walls, and won’t protect the objectives. It’s going to be a slog, and it’s an inelegant game. Not to mention that that many Iron Fang is expensive, and a nightmare to assemble (Damn bendy spears!). There is an argument for Uhlans when considering the Cygnar matchup. They can be Iron Fleshed to be a very hard target, screen Butcher as you move up the field, allow you to force her feat, and any of them that get to a stormwall with fury on the feat will really bust it up. Each charging Uhlan will deal 11 damage to a stormwall while under Fury and the feat, making any IFP that slip around very dangerous. And some will. Ponies motherf—er! I can’t stress this enough! You get a +1 on starting rolls. Both jacks, Butcher and both units of Iron Fang advance move. This means if you go second, you can shield wall forward 8” and be on the mid way line. Turn 1. If you go first, I recommend you run some IFP preferably with Iron flesh forward, to lure your opponent into shooting first turn. This means that next turn, and from that point on it will get very difficult to get models into the zones. Try to keep the Uhlans out of stormwall threat turn 1, then plow forward in a threatening position. No! Relax! Give me a moment. Both of these theme forces get up the board fast, have tough resilient casters and threaten the Haley player. You’re still expecting on some level that you will lose on attrition in the long haul, but that you’ll have such an edge in scenario and enough residual killing power to finish a wall and take a zone. Both of these lists have a lot of Arm, which is always good in that matchup. ATGM will struggle to achieve much, reducing it into a stormwall game. Claws prefers the one Stormwall matchup (I believe 1 stormwall is a better list, but less skewy), because you only need to kill one stormwall, and your army can just keep chugging through most of their stuff. Also, Butcher can expend a lot more focus killing that one stormwall, because after its down he’s pretty safe. Watch out for Tempest Blazers though. Those guys are ball busting. Vlad actually probably prefers two stormwalls. The existence of boomhowlers, or any kind of tarpit can be a problem for that list in threatening the ‘walls. If you run forward, they will get shot, then jammed up. This gives her an extra turn or two to shoot down the Uhlans. Also, 1 ‘wall lists are more likely to have Aiyana, and make Vlad much more worried. The third option, and probably my personal favourite is Butcher3. This could be the glamour of a new caster, but Butcher3 can threaten 10” under Haley’s feat and still wreck a stormwall, he can even do it without feating, if you plan carefully, though you probably still want to feat back up to full camp. The most played Argus models. Probably already. And there’s only 2000! There aren’t a lot of options set in stone for Butcher3 yet. I’m actually of the opinion that though one or two lists might take over as the most popular lists with him, he is so independent and powerful that you can build him in a lot of different ways, similar to Haley2 and Morvahna2. Next week, and possibly the week after that, I’m going to be talking about Butcher3 in that matchup, with Vassal diagrams and model discussions. I would love feedback in the interim. Let’s put Haley2 back in the case.